Although she didn’t have many pets growing up, Stephanie always knew she wanted to work with animals for a career. As she began to explore the options within veterinary medicine, Stephanie realized that the Veterinary Technician position was the perfect fit for her! Stephanie grew up in Minnetonka with her parents and older sister. She was still in high school when she got her first job in the veterinary field as a kennel assistant in an animal hospital; she stayed there while attending technician school at the Medical Institute of Minnesota (now Argosy University). Stephanie completed her internship right here at Golden Valley Animal Hospital before being hired on full time after graduation. Client education is Stephanie’s favorite part of her job—it’s incredibly rewarding for her to teach a new pet owner about the best possible care for their animal. 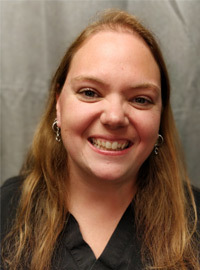 Stephanie also likes performing dental cleanings and running lab work. Stephanie lives with her husband, Eddie, their son Nick and daughter Audrey. They share their home with a Quaker Parakeet named Rubix, a Green-Cheek Conure named Abu, and a Munchkin cat named Billy who has the loudest purr Stephanie has ever heard. In time away from the clinic, Stephanie enjoys scrapbooking, attending concerts, cross-stitching, and quilting. She’s even made several complete quilts for friends and family members!